This article is about the Wario World enemy. For the Donkey Kong animal buddy, see Enguarde the Swordfish. Swordfish are fish enemies found in the game Wario World, in the Horror Manor level. 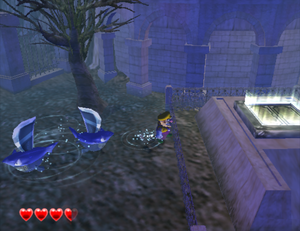 When Swordfish are in the water, the player can see only their razor-sharp fin sticking out of the water; other than that, they are submerged and invulnerable to Wario's attacks. However, without warning, a Swordfish may jump out of the water and try to bite Wario. While they are out of the water, Wario has a chance to attack the Swordfish. Once it is dazed, Wario can pick it up and use a Mega Toss, Piledriver or Wild Swing-Ding on it to defeat it. If a Swordfish leaps out of the water onto dry land, it remains vulnerable until it goes back in the water. This page was last edited on January 14, 2019, at 23:14.